Lisa Falkenberg remembers the Wendy Davis filibuster and complains about what has and hasn’t happened between then and the one-year commemoration of it. You don’t just dust off a social movement because a year has passed and you need to raise money. The fire Davis lit has to be fed and tended if it’s going to spread. 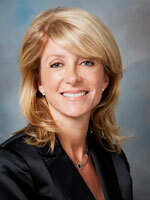 The Fort Worth senator may take for granted votes of those who already joined her cause. But what about the social liberals and moderates who haven’t joined Davis’ cause? What about the sympathetic but distracted voters who need to be deeply moved to get to the polls in November? Some of her supporters agree with me and think Davis ought to dance with the ones that brung her. Others don’t. State Rep. Senfronia Thompson, D-Houston, a veteran advocate for women’s rights, says the movement hasn’t lost momentum. It’s just spread out. “At some point, people want to see the results on bread and butter issues that affect their lives every day, like equal pay and minimum wage,” she added. Thompson is right in saying abortion isn’t an everyday issue for most Texans. But neither is gay marriage or gun control. Reproductive liberty gets under our skin in the same way. We’re talking about constitutional rights. Other Davis supporters say she has done enough talking about the issue. Indeed, who has talked more? The problem, though, isn’t that we’re unclear. The problem is that we’re unmoved. And that’s no way to lead a movement. I get the complaint about fundraising. I’ve heard it from other folks, too. Not to state the obvious here, but 1) Wendy is going to need a lot of money to have a chance against Greg Abbott, who is already mounting plans to carpet-bomb the airwaves this fall, and 2) if those emails weren’t effective, she’d have stopped sending them. Any mail client worth its salt has filtering options. No one has to see these emails if they don’t want to. Falkenberg’s complaint comes in two parts. First, she thinks Davis should be talking more about abortion since it was her passionate defense of abortion rights that led directly to the amazing events of a year ago and ultimately to Davis’ gubernatorial campaign. Again, I get the complaint and have heard it from others. But honestly, what is there to say? One of the problems here is that Governor Wendy Davis can’t actually do anything to undo the harmful legislation that was passed last summer and in the sessions before that. She can’t roll back any of the provisions of HB2, she can’t do anything about stuff like the kneecapping of Planned Parenthood and the Women’s Health Program, and she has no authority to force the Attorney General to not defend the law in court. Politicians get into trouble when they promise things they don’t have the power to deliver. The former two require legislative action, and that ain’t happening. The one thing she can do is promise to veto new restrictions on abortion. I’m not sure how much value there is in this – I mean, everyone does know where she stands on that, and I at least find a lot of talk about the need to draw lines in the sand and stand firm in defense of what we have left to be more grim than inspiring. YMMV, I guess. Falkenberg, to her credit, recognizes the political calculations behind all this. Campaigns are choices, and we can always disagree about which choices will be the most effective. My complaint with Falkenberg’s column comes in two parts. One, she never acknowledges that leading a movement is about much more than just talking about an issue. Davis is very much trying to reach out to and connect with those sympathetic but distracted voters – it’s the keystone of her whole campaign! – she’s just doing it by doing the grunt work of organizing, block walking, phone banking, and so forth. Maybe that’s not what inspires Lisa Falkenberg, but as the Battleground Texas folks can attest from their experiences with the Obama campaign, it works pretty well for getting people to the polls. No guarantees, of course – maybe it won’t be as effective here, and even if it is it may not be enough. But it’s a pretty well-established way to lead a movement, and if you think otherwise, I’d like to know the reasons that aren’t about your own preferences. And two, if you were inspired by Wendy Davis a year ago and you’ve been sitting around waiting for her to inspire you again, I’m sorry but you’re part of the problem. That grunt work of organizing I mentioned? It doesn’t happen by itself. Michael Li of the great Texas Redistricting blog has posted to his Facebook wall many times about how some Democratic activists seem to prefer carping about campaigns than participating in them, and how a lot of us tend to spend our time talking to each other instead of talking to the Presidential-year-only voters (I’ll say it again: Roughly half of the people that voted for Barack Obama in Texas in 2008 did not cast a vote in 2010) and the people who aren’t registered but could be. Now that’s no way to lead a movement, because a successful movement has many, many leaders in it. Disagree all you want about the choices Wendy Davis is making, but if you’re sitting on the sidelines, you need to ask yourself why you’re not involved. I’m going to close with a bit from this Ross Ramsey article in the Trib, which I thought was one of the better analyses of the filibuster and the celebration of it. The filibuster was a big deal, whether you were delighted by it or dismayed. It added to efforts that were already underway — from Battleground Texas and others — to rebuild the state’s patchy network of liberal voters, and now it is a rallying point for Democrats. And it got conservatives calling for changes in the way the Senate does its business. The Republicans got their law. The Democrats found their candidate for governor after her filibuster triggered an invigorating public display of the power of crowds. The real measure of the anniversary will come in the general election in November. The people who assembled at the Capitol a year ago learned at least as much as the Senate did. They came, they made noise, they had an impact, and they found out that they were not alone in a political environment that is dominated by people they disagree with. Sustaining that kind of passion is difficult, but so is getting it started in the first place. That’s why they’re celebrating. Amen to that. I understand why a journalist like Lisa Falkenberg might be reluctant to participate in a BGTX phone bank or block walk. But as both a journalist and a voter, I think Lisa Falkenberg should check a couple of them out to see what inspiration looks like to the people participating and the people they’re talking to. Who knows, maybe she’ll find a little of it for herself, too. Texas will turn blue – It’s just a matter of time!